Neil Young Archives Vol. 1: Design | Gary Burden for R. Twerk & Co.
was just too much -- too much music, too much history. And this archive began to take on a life of it's own. With each year that passed, there was that much more that we found, that much more new stuff to include, that much more that could be done from a technology standpoint. The Blu Ray version of the Neil Young Archives Vol. 1 is by far the most comprehensive and interactive box set ever done. The design was originally meant to be a box that could house 10 CDs, a poster, the stash box, and a book. But, as we worked with the archivists and found more and more material, I began to see the ways that I could make the "box" more than a box. The box. The original design of the outer box was flatter and more square so that it would fit into a wooden frame, but we realized that would be too costly, and not the best way to house the discs, so we went for a taller design, so that everything could stand up in the box. I incorporated newspaper into the background design of the box, as well as the case that houses the discs. It also mirrors the contents of the journal, which contains hundreds of newspaper articles — I think it really ties the Archives together. The thick black lettering that wraps the outter box was intentional for store displays. When you put four boxes side by side it spells out Neil Young. 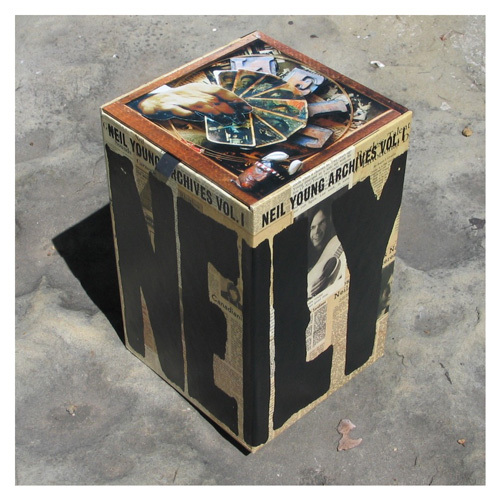 The artwork on top of the box is a piece done by my wife, , called "Neil Letters," from her Neil Young Series. The stash box. Anyone who grew up in the 60's will get the significance of the stash box. It was another way to pay homage to the times. I wanted to include a pack of rolling papers and a lighter, but that wouldn't fly. But we did manage to print a few forgotten seeds in the corners. The wood grain design inside the stash box is remnant of one of the first design concepts of fitting the whole Archives box into a wooden frame. This stash box hidden within the larger box contains a replica of a Whisky A Go Go "speaking pad," a bonus Sugar Mountain Live at Canterbury House 1968 CD & DVD, and a card that can be used to download MP3s of all the audio tracks from the Archives. The discs. 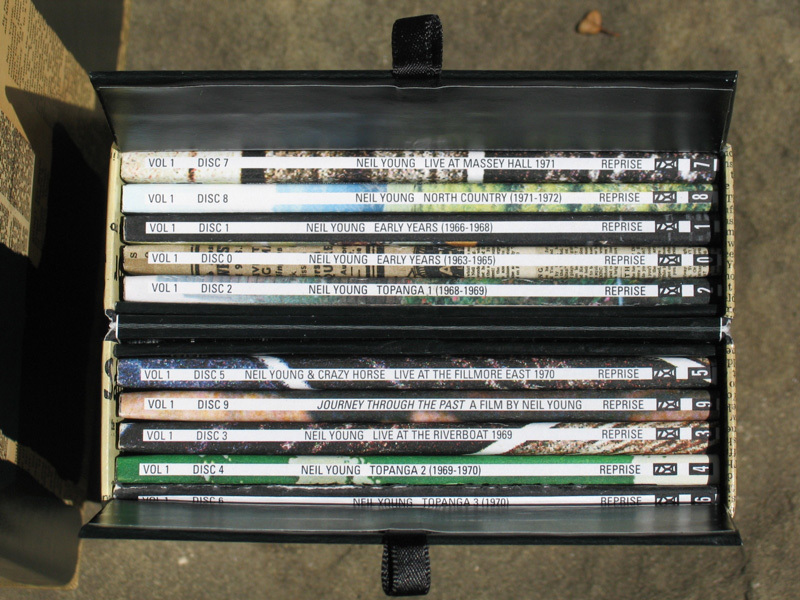 The design of the DVD box mimics the design of the big Archive box in that it has the newspaper background and the thickly painted black letters that spell out NEIL. On the back side of this is a closeup shot of Neil in jeans that I colored in by hand. 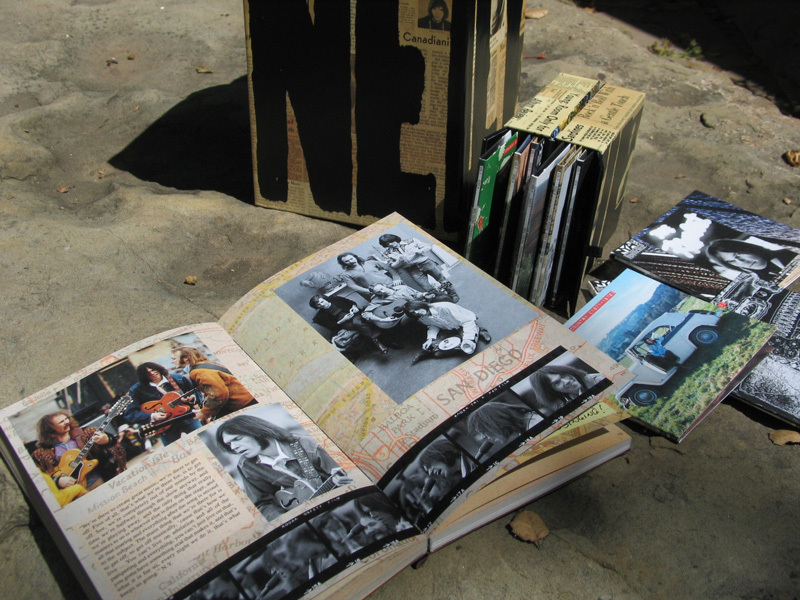 Inside the box are 10 DVDs that tell Neil's life from 1963 - 1972. The images on each sleeve come straight from Neil's past and correspond to the music and time period covered by the DVD. You'll notice we worked newspaper into some of these, too. The poster. The poster was designed by Toshi Onuki, who organized the information in the Neil Young Archives Vol. 1. The journal. This was probably my favorite part of the design process. Neil has a leather bound journal that we wanted to imitate and include in the Archives because a journal is so private and also so telling. This journal, which contains rough lyrics, maps of Neil's travels, newspaper articles, old family photographs, sketches, notes, phone numbers and so much more. Out of everything in the Archives, the journal represents Neil's journey the best. We wanted the journal to feel and appear like Neil's original hand tooled, inked, and engraved journal without it actually being leather. We worked with material suppliers from around the world before we found in Phoenix. They had the cover substrate handmade in Mexico and then silk-screened the substrate to match the colorization of Neil's journal from the 60's. We used Mohawk Via for the pages because the paper was sturdy enough to stand up to the heavy amounts of ink we used to get it as close to the original journal as possible, down to every coffee stain. The overall process always starts with sketches — I sketch, Neil sketches, then we meet and talk about our ideas, just as if I were designing him another cover. Back before computers and Photoshop came along, I used to make dye transfers, and the process would take weeks. Now, we sketch things, scan them into Photoshop, email each other, edit it in Photoshop, send it back, then go back to the drawing board. The design is never really made in Photoshop, because I always start with the physical sample, then tweak it in Photoshop, and if it looks good in Photoshop, I make the tweaks to the physical sample. I use it as a tool, not as my workshop. So, we started with sketches, then Neil called in our archivist, Joel Bernstein, who collected material from every conceivable source. To say the very least Joel is detail oriented. We went to Neil's ranch and laid out everything chronologically on a table and just walked around it for a while. I mean, man! There was a lot of material. Then, from there, we just kept collaging things together, figuring out how to incorporate them, then kept refining and changing it until we had what's in stores now. Gary, Jenice, and cohorts, the Archives set is unquestionably the most outstanding work of its kind. it is completely original, fascinating to explore, and does justice to a daunting amount of music and history. I'm looking forward to the next installment. I have some clippings and photos regarding Neil, CSNY, and his other incarnations from about 1973 on; probably a stack about 5 inches high. You probably have most of this stuff (Rolling Stone articles and various other magazines for the most part). Do you guys need this for the next installment on the Archives? Let me know. Thanks again for your outstanding work. Volume 1 has been out over 6 months and I have been just about through the whole thing. analog remastered of ON THE BEACH! in the Archives series. Definitely one of my all time favorite from Neil.